“The smartRVcontrols is a revolutionary product in the RV industry. Having an easy-to-use switch module to replace or use with the existing switch will make RV users’ lives more stress free, allowing them to enjoy their vacations so much more,” said Herb Gingold, owner of RV Intelligence. 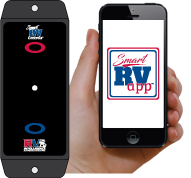 RV Intelligence is excited to announce its newest product, smartRVcontrols, a revolutionary aftermarket DIY remote control module that is connected to a smartphone or tablet. A smartRVcontrols module is configured via the smartphone app to control any one of multiple functions in an RV. “This product is what RVers have been asking for. You can now get the remote control features of high-end RVs, you can easily install smartRVcontrols yourself, and you canoperate multiple features with your smartphone in your RV,” stated Gingold. The smartRVcontrols are multi-function remote control modules that are configured in the smartRVapp to control more than eight different features in an RV, such as lights (bulb or LED), jacks, awnings, slides, relays, valves, RGB LEDs and more. Users download the free smartphone smartRVapp, available for iOS and Android, to configure a module for the function needed. The smartRVcontrols have a 100-foot range, and cell/Wi-Fi service is not needed for operation. The smartRVapp can control multiple smartRVcontrols at the same time. REPLACE: Replacing the existing switch with a smartRVcontrols module is the first installation option. In minutes you will have smartphone control of your RV feature. The smartRVcontrols module connects directly to the existing wiring and covers the mounting hole. WORK WITH THE SWITCH: Working with the existing switch is the second installation option. The smartRVcontrols module has external switch inputs. Using quick disconnects you can easily connect the smartRVcontrols module into the wiring to control the feature via your smartphone. The original switch will still work at all times. STAND ALONE: A stand-alone switch is the third installation option. This option allows you to add new smartRVcontrol features to any RV and control them with your smartphone or the smartRVcontrol switch directly. RV Intelligence was founded in 2017 by Herb and Vicky Gingold. It started with the desire to make their RV vacation experiences more stress free by solving common camping problems, eventually introducing their innovations to the RV market. In addition to the WoBLR and Hitch PinLeash, RV Intelligence continues to develop products to make RV life easier. “RV Intelligence always strives to develop new products that provide RV customers with features found in high-end coaches. We are always working on new ideas,” said Gingold. About RV Intelligence: RV Intelligence creates “Smart RV Products for Smart RVers.” We manufacture aftermarket products and accessories for the Recreational Vehicle sector. Family owned and operated by RV enthusiasts, all products are designed and manufactured in the USA. Please visit our website at www.rviqproducts.com.